In this groundbreaking book of new reportage, sure to stir a global debate, journalist Jeremy Scahill-author of the acclaimed international bestseller Blackwater-takes us into the heart of the War on Terror's most dangerous battlefields as he chases down the most important foreign policy story of our time. From Afghanistan and Pakistan to Yemen, Somalia, and beyond, Scahill speaks to the CIA agents, mercenaries, and elite Special Operations Forces operators who populate the dark side of American war-fighting. He goes deep into al-Qaeda-held territory in Yemen and walks the streets of Mogadishu with CIA-backed warlords. We also meet the survivors of US night raids and drone strikes-including families of US citizens targeted for assassination by their own government-who reveal the human consequences of the dirty wars the United States struggles to keep hidden. 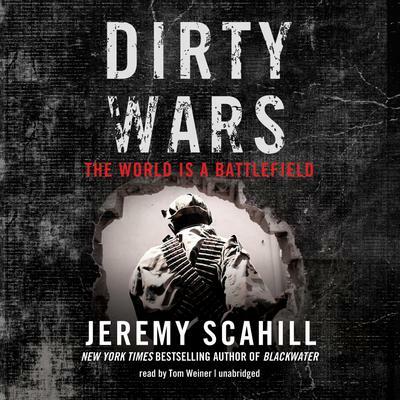 Written in a gripping, action-packed narrative nonfiction style, Dirty Wars: The World is a Battlefield reveals that, despite his pledge to bring accountability to US wars and to end Bush-era abuses, President Barack Obama has kept in place many of the most dangerous and secret programs that thrived under his predecessor. In stunning detail, Scahill exposes how Obama has escalated these secret US wars and has built up an elite secret US military unit that answers to no one but the president himself. Scahill reveals the existence of previously unreported secret prisons, kidnappings, assassinations, and cover-ups of covert operations gone terribly wrong. In this remarkable story from the frontlines of the undeclared battlefields of the War on Terror, journalist Jeremy Scahill documents the new paradigm of American war: fought far from any declared battlefield, by units that do not officially exist, in thousands of operations a month that are never publicly acknowledged.The devastating picture that emerges in Dirty Wars is of a secret US killing machine that has grown more powerful than whatever president happens to reside in the White House. Scahill argues that far from keeping the United States-and the world-safe from terrorism, these covert American wars ensure that the terror will grow and spread.